Is Oakland Council President McElhaney Faking Sick, Canceling Meetings to Avoid Hearings on Ethics Violations? Oakland Council President Lynette Gibson McElhaney skipped most of last night's council meeting to attend a party for Congresswoman Barbara Lee instead. Did Oakland City Council President Lynette Gibson McElhaney fake sick last night to push back a city response to damning Grand Jury accusations? At last night's city council meeting, a McElhaney staffer told the Express that McElhaney had bronchitis and could not attend. Councilmember Larry Reid chaired it in her place. 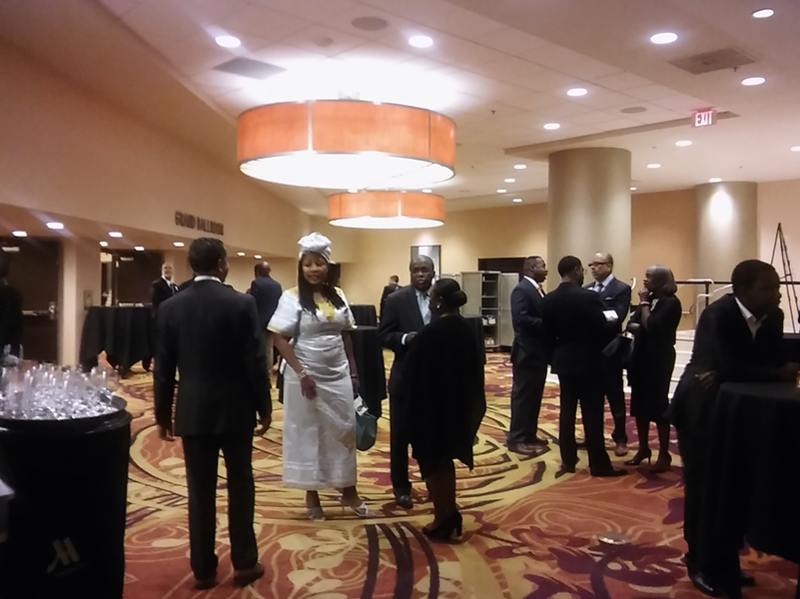 But Oakland Post publisher Paul Cobb said during public comment that he'd spotted McElhaney moments earlier, at a party being held at the Oakland Marriott Hotel, just three blocks from City Hall. The Express left the council meeting at approximately 9:20 p.m. and went to the Marriott. There, McElhaney was mingling with guests at a party being hosted by Assemblyman Rob Bonta and U.S. Sen Cory Booker, in honor of Congresswoman Barbara Lee. After the party, McElhaney finally showed up at the council meeting and took her seat shortly before 10 p.m. Conveniently, she arrived four hours late — and after an agenda item to discuss and respond to her alleged ethics violations. The councilwoman is facing possible censure by colleagues due to a recent Alameda County Grand Jury report, which accuses McElhaney of abusing her position of power by interfering with a planned townhouse development next to her home. The city's long-overdue response to the Grand Jury was scheduled to be heard last night. According to the report, and an earlier investigation by the Express, McElhaney used her office staff to appeal against the project, and also had the city's planning director intervene. The project's developer eventually gave up, and the townhouses were never built. The city council, mayor, and public-ethics commission are all legally required to respond to the Grand Jury within ninety days of receiving the report. Per state law, their responses must include detailed explanations of whether or not they agree with the Grand Jury's findings, and how they plan to fix any problems. But Oakland's deadline was September 21, and so far, only the public ethics commission has responded. In addition to last night, McElhaney also canceled rules and legislation committee meetings on October 6 and 13. She also skipped a council meeting on October 4. On the agenda for both of those rules meetings was an item discussing the Grand Jury's findings, specifically that McElhaney had violated Oakland's ethics rules by sabotaging the town house development, and another item brought by members of the public and Councilmember Desley Brooks, seeking to schedule a censure hearing to have the full council decide whether or not to admonish McElhaney. Last night, several members of the public accused McElhaney of hiding from the Grand Jury's charges and canceling meetings to prevent her ethics violations from being publicly discussed and ruled on by council. Noni Session, who is running against McElhaney for the District Three council seat, said the Grand Jury report was correct and the council should take action to hold McElhaney accountable for ethics violations. "The Grand Jury got it right," said Noni Session, who is running against McElhaney for the District Three seat. "This sick-out is known to not be real." Before McElhaney arrived last night, Reid attempted to have his colleagues approve a five-sentence letter as the council's official response to the Grand Jury. The letter stated only that the council was aware of the Grand Jury's report, and that they are waiting on the city's public ethics commission to complete its investigation of the allegations against McElhaney before taking any action. Brooks accused other members of the council of "hiding behind the public ethics commission," rather than weighing the evidence themselves and deciding whether or not to censure McElhaney. According to Brooks, the city council's rules of procedure do not require the public ethics commission to investigate anything before the council considers whether or not to censure one of its own members. Brooks filed a motion to censure McElhaney, including a copy of the Grand Jury's report and other evidence, with the Oakland City Clerk on October 4. That same day, the clerk delivered physical copies of the censure papers to McElhaney. Later that afternoon, McElhaney claimed to be feeling sick and was absent at the evening council meeting. 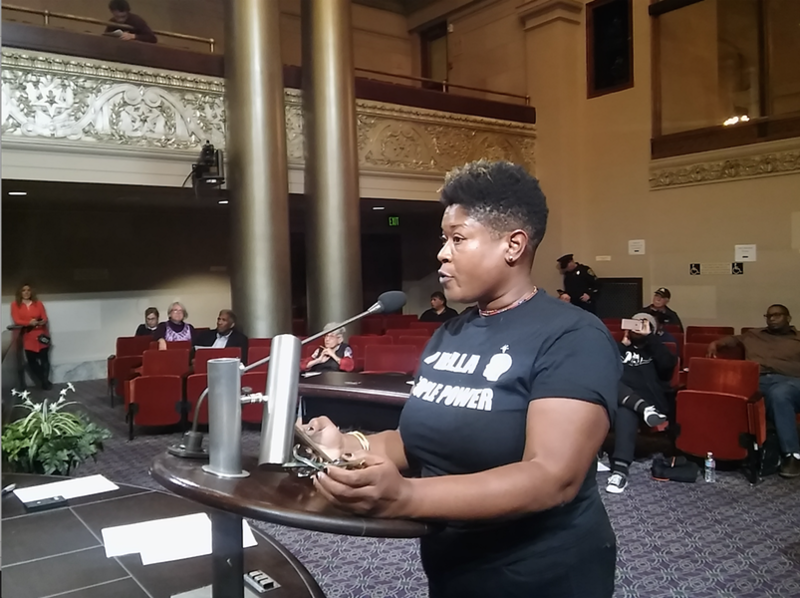 Last night, Councilmember Annie Campbell Washington attempted to bring the city closer to providing the Grand Jury with a response by making a motion to tell it that Oakland will follow its censure process and hold a hearing. As a result, a motion to schedule a censure hearing of McElhaney is now set for the rules and legislation committee meeting this Thursday. After the meeting, McElhaney posted a long note on Facebook, saying she acted "contrary to doctors advice" by attending the party for Lee. "After the ceremony, since I was already out of the house, I decided to head to the Council meeting in progress," she wrote.